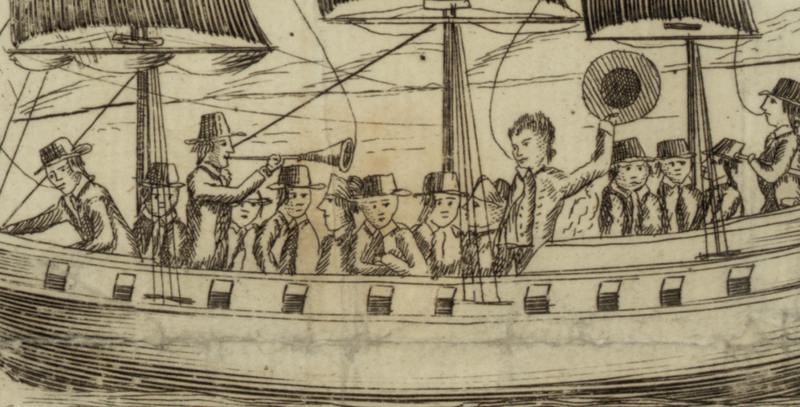 "Con-g-ss embark'd on board the ship Constitution of America bound to Conogocheque by way of Philadelphia," artist unknown, 1790, Library of Congress. American independence did not free political cartoonists from the tradition of crowding their works with people, difficult to read word balloons, and meaning that is difficult for a modern audience to interpret. In July 1790 Congress decided to move the seat of the federal government from its original site in New York to Washington, with Philadelphia as an interim capital. The unidentified satirist gives a cynical view of the profit opportunity which this presented for Philadelphians. A three-masted ship with a smaller boat in tow sails toward a fork in a river. It is being lured by a devil toward the lower fork (eventually leading to Philadelphia), which falls precipitously in a rocky cataract, and away from the fork which leads to the "Potowmack" river. A devil beckons them on, saying, "This way Bobby" (referring to Robert Morris, the alleged instigator of the move). Steering toward the falls from its opposite side, a small boat with three men plows upstream. They express their mercenary attitudes toward the impending destruction of the Constitution of America. "If we can catch the cargo never mind the Ship," says one. "Keep a sharp look out for a majority and the treasury," says another. Their mate, apparently replying to both of them, agrees: "Ay, Ay that's what we are after." The men wear round hats with short brims, but are perhaps meant to be gentlemen in gentleman's suits, rather than sailors. 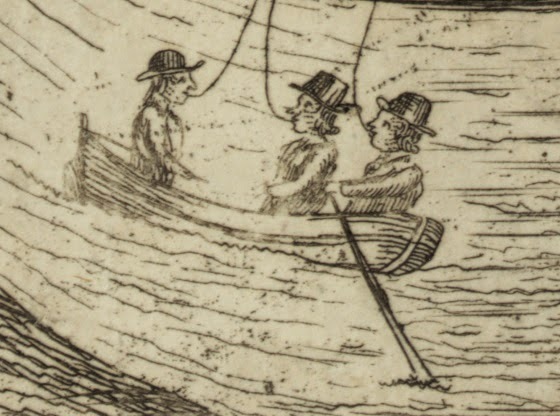 The coxswain has the tall collar and long hair of a landsman. While the oarsmen do not exhibit either the cut of coat or long hair of their cox, they may well be interpreted as gentlemen as well. The men crowded on the Constitution of America are likewise dressed in the style of congressmen, rather than tars. Drop down collars, cravats, and cocked hats are scattered throughout. The only detail that seems to match the clothing of common sailors is the lack of cuffs on their coats, and the tall crowned round hats. Being no expert on gentleman's clothing of 1790, I leave it to the experts to interpret these clothes further.